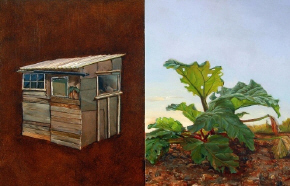 Julian Perry’s ‘A Common Treasury’: the Sheds Lost to the Olympiad pictures the home-made allotment sheds of the 100-year old Manor Garden in London. His show runs until 16th November 07 at the Austin Desmond gallery in London. “the sheds themselves are now buried behind the 11-mile wall of the Olympic Security Zone”, to be replaced by “a sterile open space and a zigzag concrete path between sporting venues”.